When the cat’s first get to Cat’s Whiskers they are put up onto the sofas in our waiting area next to their owners as cats like to be up high, off of floor level. 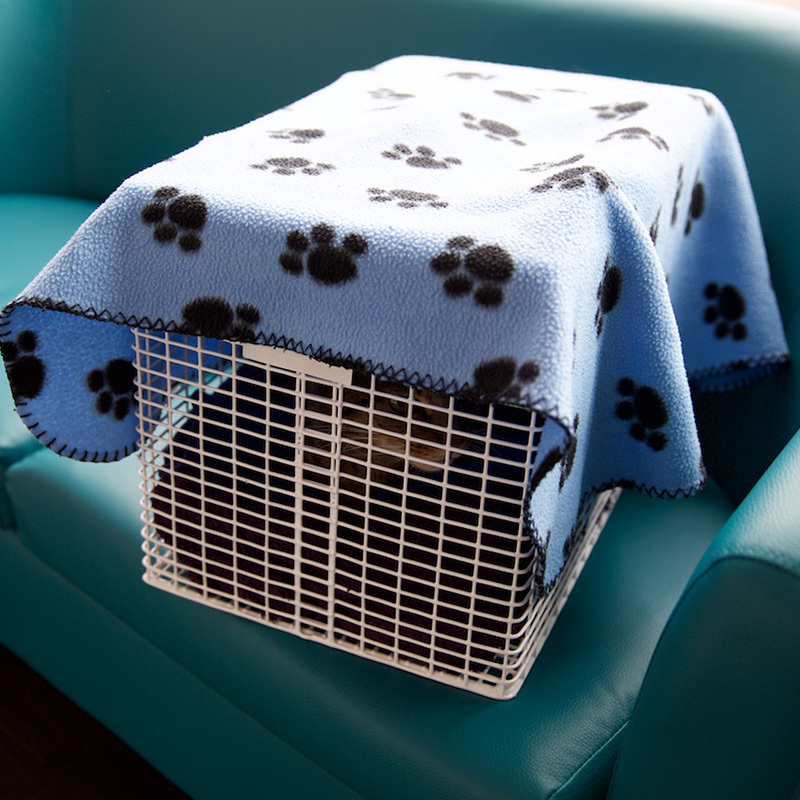 Their carriers will also be covered over by a blanket to make them feel more secure and hidden (also to prevent them seeing any other cats that are in the waiting area). The reception area is kept as quiet and peaceful as possible, apart from maybe the odd cat meowing! Once they are ready to be seen for their appointment they will come through to our consulting room. In the consulting room we have Feliway® plugged in at all times to make the cats feel more secure in the unfamiliar environment. We also have a fish tank for the cat’s enjoyment! The cats will be seen by our cat specialist vet, Amanda who has now been working exclusively with cats for the past 6 years. 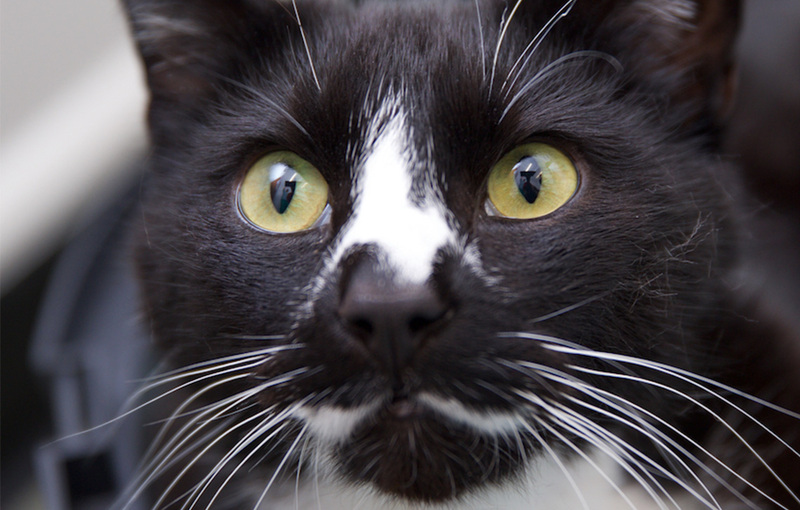 All of the staff working with the cats at Cat’s Whiskers undergo cat specific CPD and are trained in understanding the behaviour of cats and adopting the correct handling techniques. 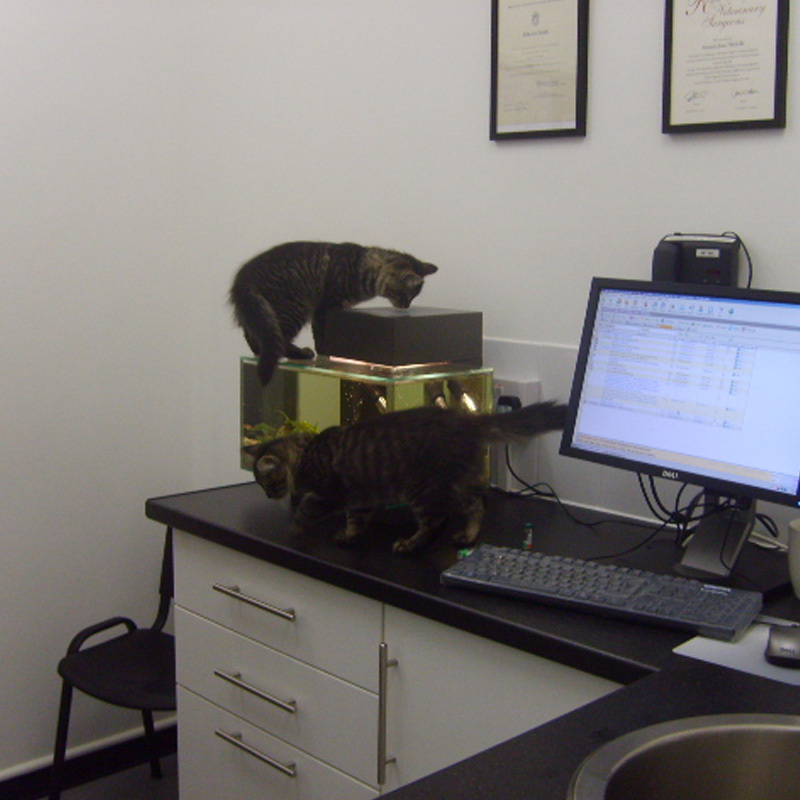 All of our consultations are either 15 or 30 minutes long to give the cats more time to relax and acclimatise to the environment before the veterinary examination starts. The cats are always encouraged to walk out of their carriers on their own accord before we consider taking the tops off of their carriers or carrying them out. All of our equipment at Cat’s Whiskers is cat specific and therefore in proportion to their size. If the cat has to stay for the day for a procedure or treatment, they will be put back into their carriers and taken through to our cattery room. They will be made comfortable in our fibreglass cages using bedding materials (including any bedding that maybe in their carriers from home). We also cover up the fronts of the cages to make the cats feel more secure in the cage. The cages are not reflective and they all face the same way to prevent the in-patients from seeing each other. 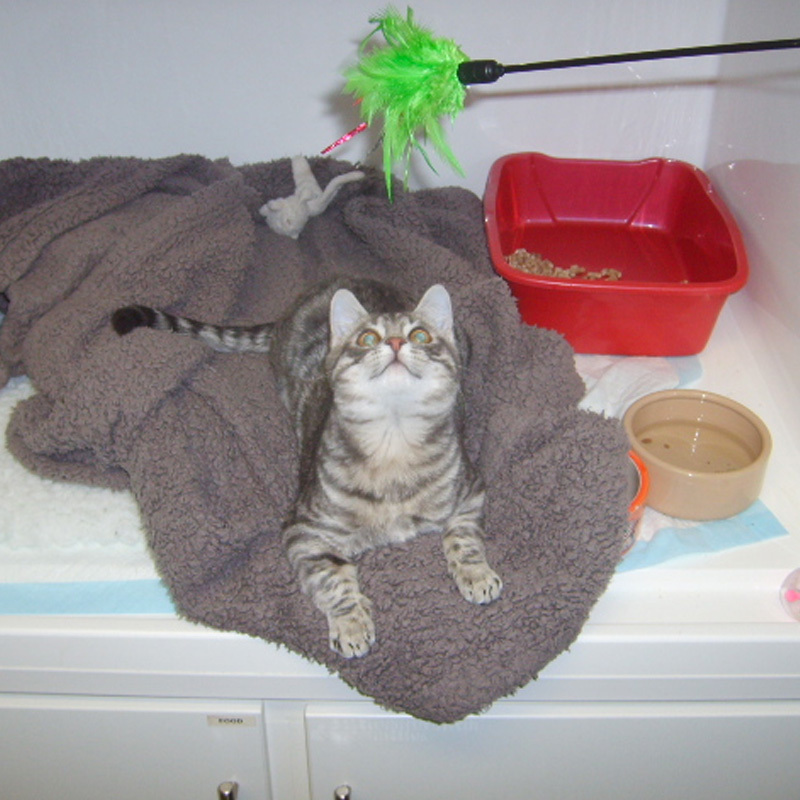 Feliway® is also plugged in to help the cats feel settled whilst they are in our care. Once their procedures have been carried they will be put back into their cage from our theatre and closely monitored to ensure that they are recovering well. 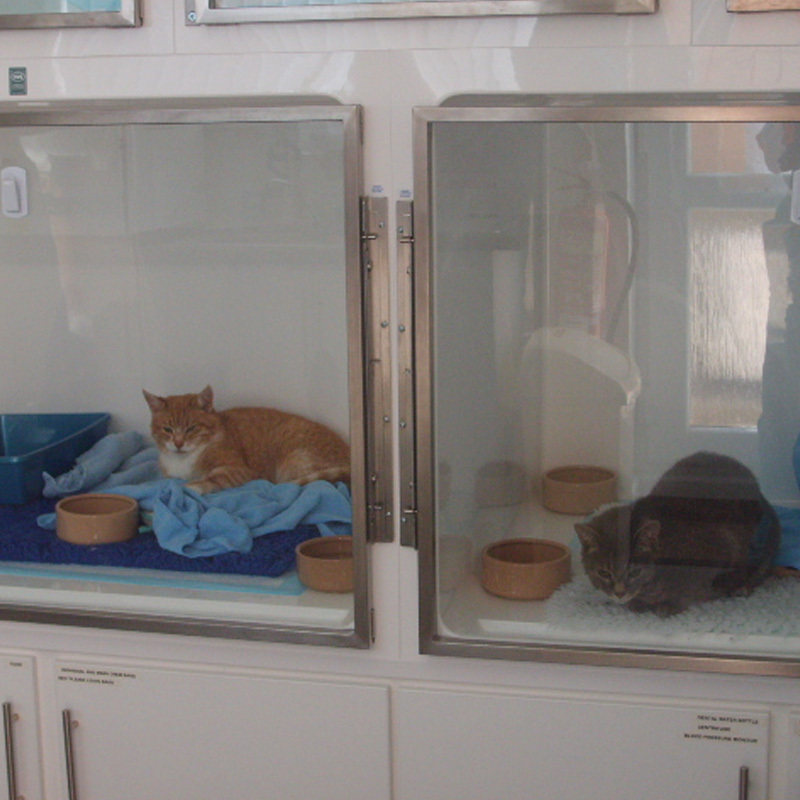 The cats are provided with heat pads to keep them warm and comfortable. When they are ready the cats will be given some food, depending on their preferred food at home. As soon as we are happy with the cat’s recovery we will contact their owners and confirm a discharge time. The cats are still monitored for the rest of the time they are with us and are given some more food before they go home. The discharges are carried out by those who have assisted with the procedure. They will explain the whole procedure and what has happened throughout the day. Post-op care will also be given for you to do when you get home. 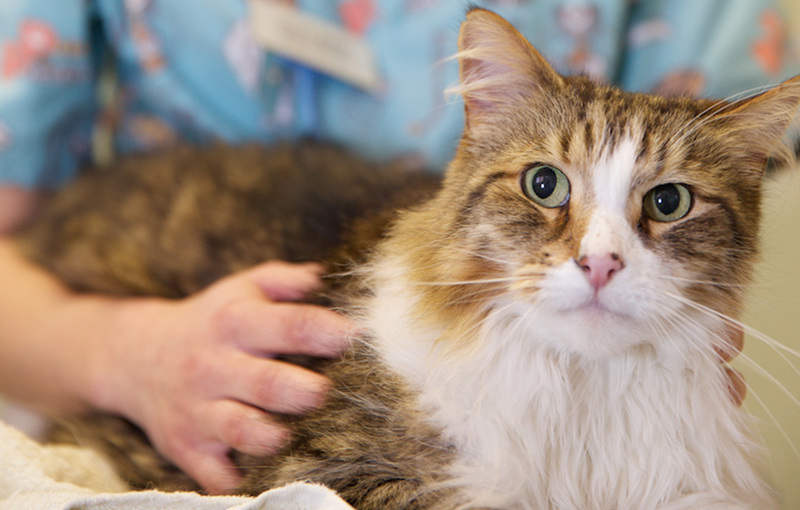 Any questions you may have will be answered at the discharge and a post-op call will also be carried out the next day to ensure your cat is recovering well and answer any further questions you may have. 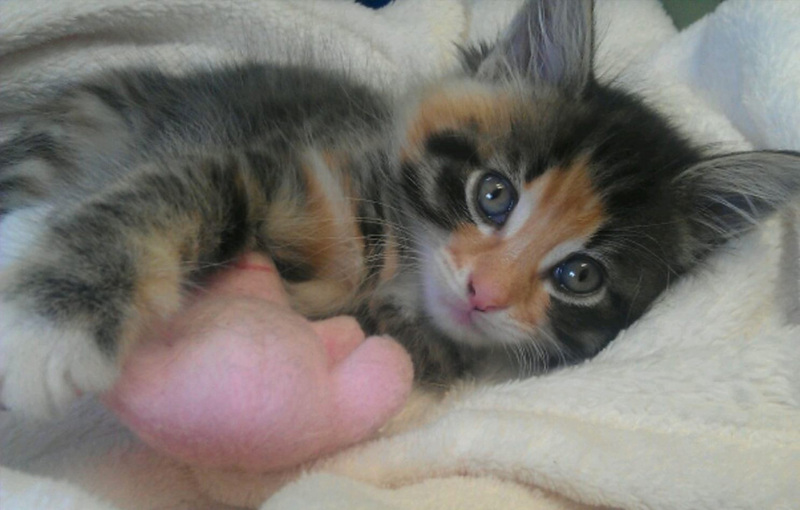 As staff members at Cats Whiskers, it is in our best interest to ensure that the cats visit to the vets is as enjoyable and stress free as possible. We take pride in our work as a cat specific veterinary clinic and hope that you, as cat owners, enjoy the experience as well as your cats.